There are tons of pencils out there, but sometimes the old designs just call to me. And they still work very well. It’s hard to beat some of the most simple writing utensils in many cases. 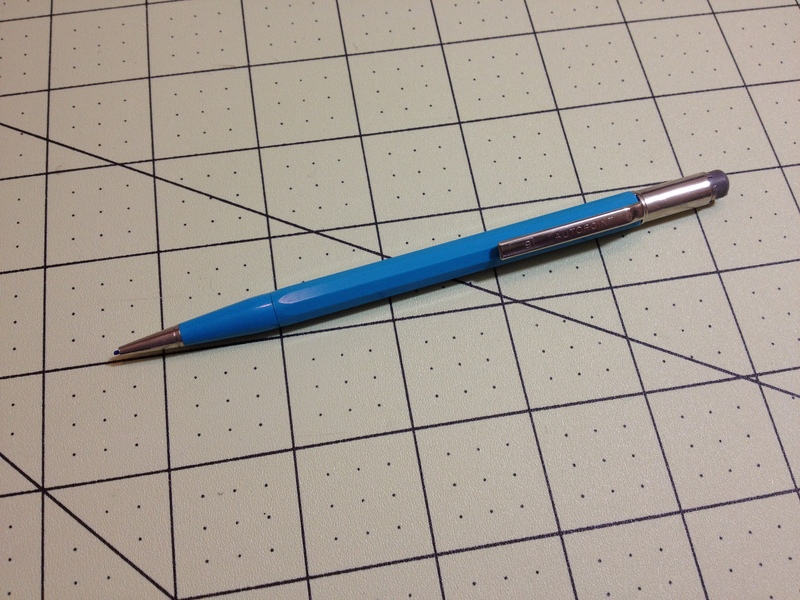 The Autopoint All American is not the simplest of pencils, but it is quite a classic and simple design that works very well. 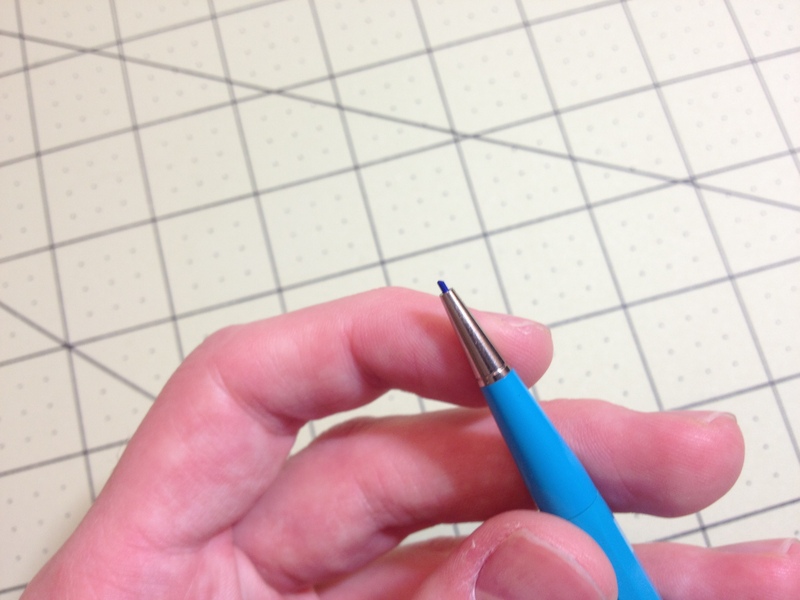 The top of the pencil is a hard, but functional, eraser held in by a metal sheath; removing this allows for access to the lead storage area. There is a metal collar that holds the clip just down from that, followed by the faceted barrel with 10 sides. This continues until the break for the twist mechanism, at which point the tip tapers down to the point of the lead. The only information is the lead size and brand on the clip, which is quite hard to read, and leaves me wishing the model name was somewhere. The mechanism is a simple wire-twist one that is a bit stiff to use. Once lead is inserted, one can twist to the right to advance the lead, or twist to the left and push on a hard surface to retract it. While stiff, the mechanism is quite solid, and the lead is held firmly in place. I have a .9 lead size version (in blue) and the lead is large enough that breaking isn’t very common anyway, and I haven’t found it to be a problem. The lead included is fairly standard in and of itself. It’s a good pencil with a classic design. The mechanism isn’t the easiest to use but it’s robust and sturdy. The pencil itself has a very utilitarian look and feel that I quite like. It feels like many of the classic pencils I have. 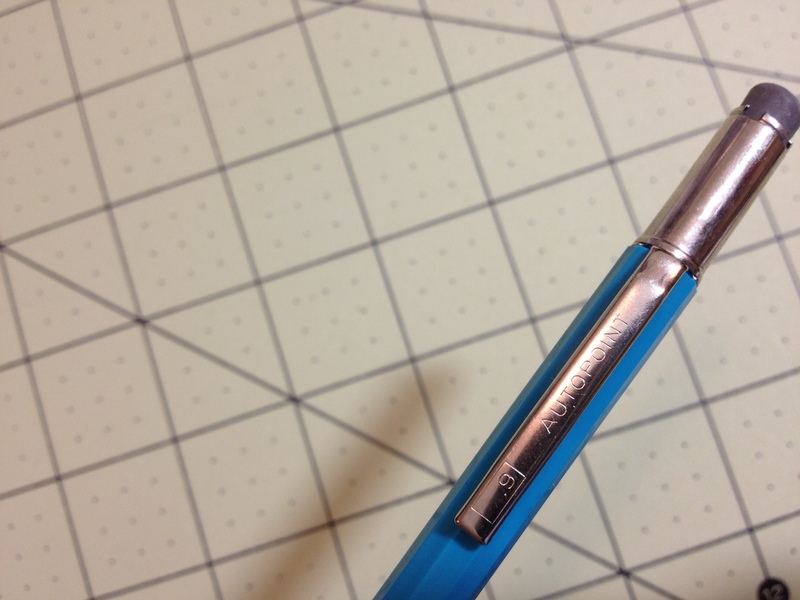 So for those looking for a classic, rugged pencil design, this is one to look out for. This entry was posted in Intermediate Supplies, Utensils and tagged art supply, art supply critic, auto point all amercian, autopoint, autopoint all american, critic, pencil, pencils, penicls, review, writing by Dragon Co (Austin Smith). Bookmark the permalink. I have an old US Government Skilpoint and it is the same pencil. Mine takes the 1.1 lead and has been used for over 40 years. No issues and just keeps working. Like most I have had a lot of pencils and they usually break. Not this one. An old design — does it really need to be better than this?